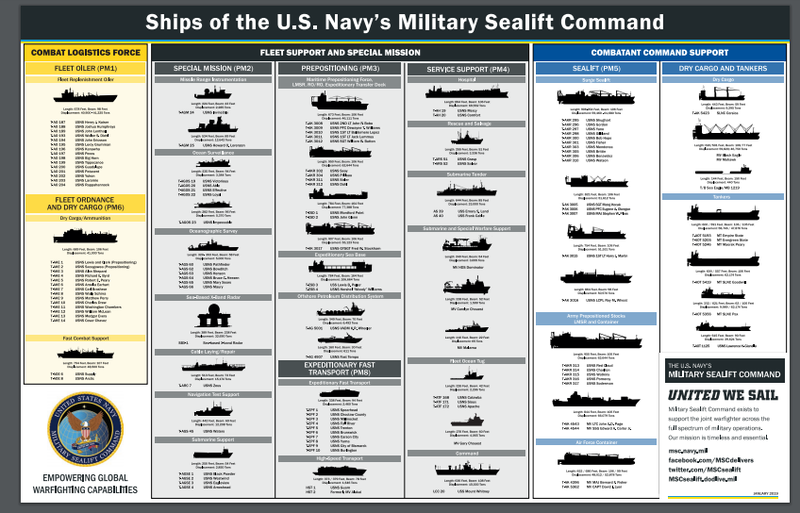 EagleSpeak: 78 Ships - U.S. Merchant Marine - the What? The Who? 78 Ships - U.S. Merchant Marine - the What? The Who? 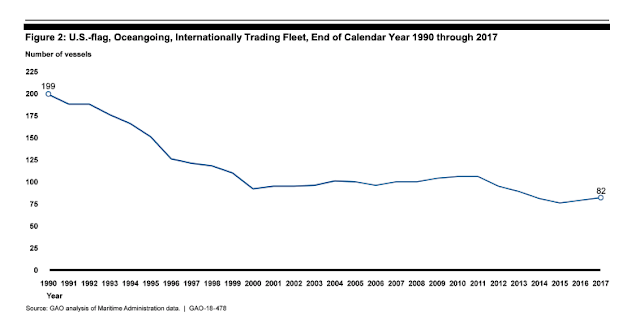 As of 15 March 2019, the inventory of U.S. flagged merchant ships of "over 1000 gross tons that carry cargo from port to port" was 180 ships. A partial explanation for the decrease in such international shipping is the increase in capacity of tankers and container ships. Another explanation is the higher cost of operating under U.S. law as opposed to operating under a foreign "flag of convenience." Of the 180, 73 are tankers, many of which are not deemed "militarily useful." Nine of the 180 ships have gross tonnage of under 2000 tons. Most of the latter are not considered as being "militarily useful." Gross tonnage (GT)\is a function of the volume of all of a ship's enclosed spaces (from keel to funnel) measured to the outside of the hull framing." The National Defense Authorization Act of 2013 requires that the Secretary of Transportation, in consultation with the Secretary of Defense, to establish a fleet of active, commercially viable, militarily useful, privately-owned vessels to meet national defense and other security requirements. 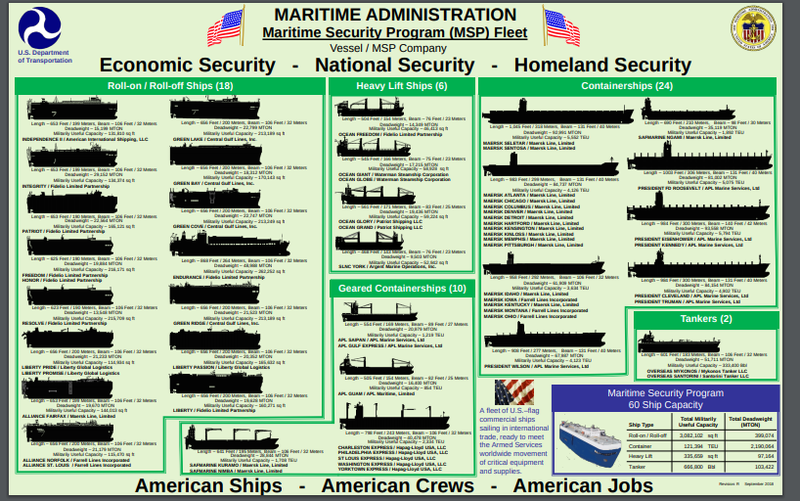 All Maritime Security Program operating agreements are currently filled by 60 ships. In the event that an operating agreement should become available, the Maritime Administration would publish a notice in the Federal Register requesting applicants. A copy of the Maritime Security Program application is listed below. Participating operators are required to make their ships and commercial transportation resources available upon request by the Secretary of Defense during times of war or national emergency. 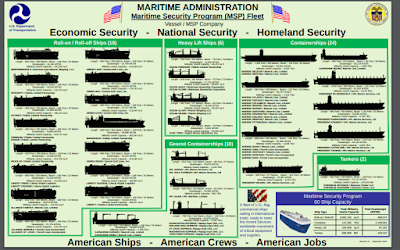 You might note that MSP ships also appear on the MARAD list. 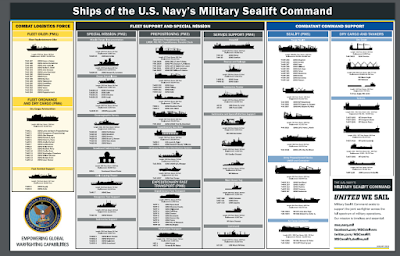 Some of these ships also appear in that MARAD merchant list. I note this to ensure the same ships are not counted twice or three times as assets available if needed. 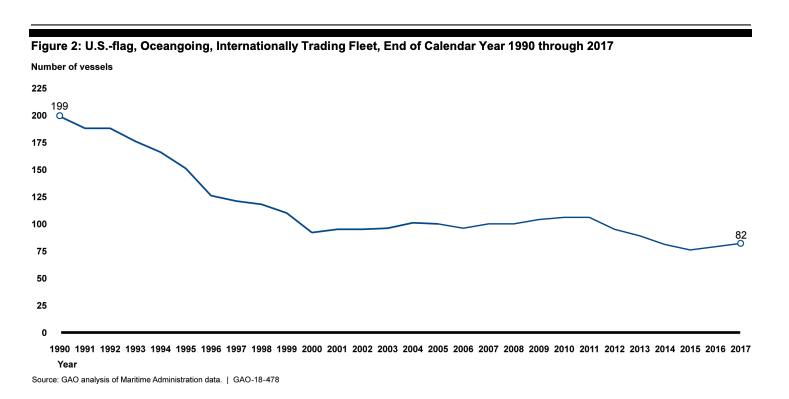 internationally trading U.S.-flag fleet for national defense needs. costs and government cargo suggest this will remain an ongoing challenge. improvements to increase the accuracy of the count of available mariners. What difference does it make? Mahan's view is that the purpose of a navy is that "Navies exist for the protection of commerce" - and what happens when the ships carrying your commerce are not of your own nation? You end up providing open lines of commerce for "free riders" who garner the benefit of free trade routes without incurring the costs of maintaining them. Under the U.S.'s post-WWII leadership, commerce among nations ballooned - China's resurgence has been, in large part, due to its embrace of international trade and its use of the trade routes protected by the United States Navy and its allies. The first and most obvious light in which the sea presents itself from the political and social point of view is that of a great highway; or better, perhaps, of a wide common, over which men may pass in all directions, but on which some well-worn paths show that controlling reasons have led them to choose certain lines of travel rather than others. These lines of travel are called trade routes; and the reasons which have determined them are to be sought in the history of the world. Notwithstanding all the familiar and unfamiliar dangers of the sea, both travel and traffic by water have always been easier and cheaper than by land. The commercial greatness of Holland was due not only to her shipping at sea, but also to the numerous tranquil water-ways which gave such cheap and easy access to her own interior and to that of Germany. This advantage of carriage by water over that by land was yet more marked in a period when roads were few and very bad, wars frequent and society unsettled, as was the case two hundred years ago. Sea traffic then went in peril of robbers, but was nevertheless safer and quicker than that by land. A Dutch writer of that time, estimating the chances of his country in a war with England, notices among other things that the water-ways of England failed to penetrate the country sufficiently; therefore, the roads being bad, goods from one part of the kingdom to the other must go by sea, and be exposed to capture by the way. As regards purely internal trade, this danger has generally disappeared at the present day. In most civilized countries, now, the destruction or disappearance of the coasting trade would only be an inconvenience, although water transit is still the cheaper. Nevertheless, as late as the wars of the French Republic and the First Empire, those who are familiar with the history of the period, and the light naval literature that has grown up around it, know how constant is the mention of convoys stealing from point to point along the French coast, although the sea swarmed with English cruisers and there were good inland roads. Under modern conditions, however, home trade is but a part of the business of a country bordering on the sea. Foreign necessaries or luxuries must be brought to its ports, either in its own or in foreign ships, which will return, bearing in exchange the products of the country, whether they be the fruits of the earth or the works of men's hands; and it is the wish of every nation that this shipping business should be done by its own vessels. The ships that thus sail to and fro must have secure ports to which to return, and must, as far as possible, be followed by the protection of their country throughout the voyage. This protection in time of war must be extended by armed shipping. The necessity of a navy, in the restricted sense of the word, springs, therefore, from the existence of a peaceful shipping, and disappears with it, except in the case of a nation which has aggressive tendencies, and keeps up a navy merely as a branch of the military establishment. As the United States has at present no aggressive purposes, and as its merchant service has disappeared, the dwindling of the armed fleet and general lack of interest in it are strictly logical consequences. When for any reason sea trade is again found to pay, a large enough shipping interest will reappear to compel the revival of the war fleet. It is possible that when a canal route through the Central-American Isthmus is seen to be a near certainty, the aggressive impulse may be strong enough to lead to the same result. This is doubtful, however, because a peaceful, gain-loving nation is not far-sighted, and far-sightedness is needed for adequate military preparation, especially in these days. We allowed our international merchant fleets to decline because it allowed for the lower cost import and export of goods on foreign hulls. It depended on the good faith participation of the entire sea-going world in maintaining good faith trade. Now, what happens if a great power develops a naval force that is not designed to allow for the continuation of these great trade routes but seeks to protect its own agenda in nearby waters - as in the South China Sea. What if that state, which engages in spirited trade with both the U.S. and the rest of the world decides to shut off the use of its state-owned "merchant ship" from that trade and attempts to create "no sail" zones for the merchant and/or naval vessels of other states. What if this power is used to coerce other states not to intervene in protection of allied states in its "sphere of influence?" We need both a larger navy and an larger, well-manned merchant marine as a preventive measure against such blackmail efforts. Thank you, another very useful logistics post that more people should read but probably won't. I've thought our loss of a merchant fleet and the shipyards to build that fleet was a glaring issue since the 1980's. We could of at least spent all the LCS money on some RORO's and tankers. Friday Film: "What's Under the Ocean?"